Hi I’m Shelley and I’m the Yorkshire and Humberside (Y&H) regional lead for DWP’s LGBT* network, DWPride. I’m passionate about increasing awareness of diversity and inclusion in DWP and more widely across the Civil Service. I’m also a friend and ally to a:gender, which is a cross Civil Service organisation that supports trans, intersex and non-binary civil servants. Over time I noticed that a lot of the communications that we see on LGBT* issues focus on the ‘L’ and the ‘G’ aspects, but that there is comparatively little about the ‘T’ and the ‘*’. And for those of you who don’t know the terminology, that’s Lesbian, Gay, Bisexual and Transgender. 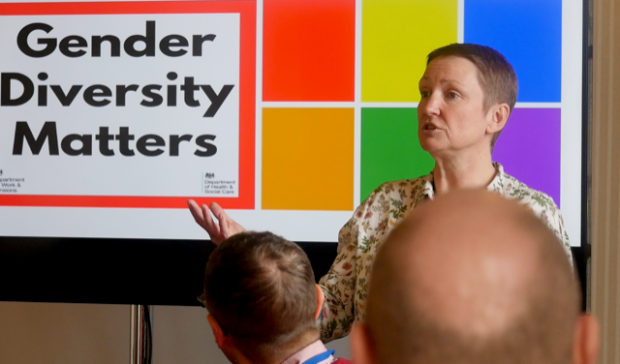 In DWP we use the * to cover all other variants and identities that people prefer, from questioning to intersex, queer to ally – we don’t want to limit people with labels. This screamed out to me that more needs to be done to help raise awareness of these people and I wanted to do something about it. So I decided to organise an event where we could talk about the issues faced by these communities in Y&H, specifically focusing on transgender and intersex. It’s important to me that I help to spread the message that as civil servants, it’s vital that we understand and have empathy with people from a wide range of diversity groups. This includes people who have more than one characteristic to who they are, for example that person could be a lesbian with mental health problems and from an ethnic minority group, or a disabled, transgender man. This is because we are either providing services for, or working with, people like them and we need to meet their needs. 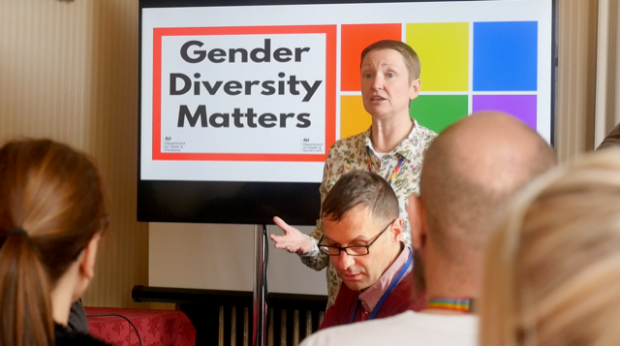 I’d seen a;gender speakers at an event last year, so I reached out to them to see if they’d be up for doing something similar in partnership with me. I was delighted when they were and immediately set about making arrangements. Now, anyone who knows me will know I’m a natural born collaborator. If I was a stick of rock, collaboration would be written down my middle. So, I got in touch with Jenny Turner from the Department of Health and Social Care, to see if she wanted to get involved. 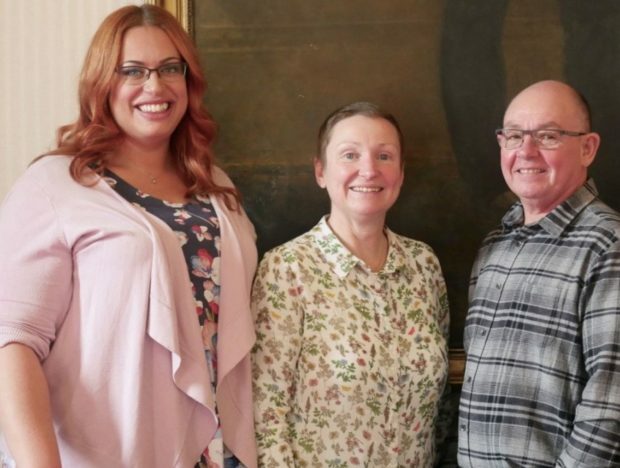 We’d previously worked together last summer to hold a Pride event in Quarry House, so I was glad to find out Jenny was up for it and we started getting stuck into making arrangements. I’d managed to contact most government departments and it wasn’t long before requests to attend the event were coming in thick and fast. I still worried that we’d not get enough interest to justify the effort or fill the room, though. How wrong I was! Seats were ‘sold out’ with every seat filled on the day. This was no mean feat for a Friday at half-term. And I’m delighted to say that it was an outstanding success. During the event I nervously watched delegates’ reactions to the speakers. Everyone was absolutely captivated by them. Their personal stories were both moving and engaging. It was a real roller-coaster of a ride, with tears of empathy one minute and full-on belly laughs the next. Everyone was totally mesmerised by the way the speakers shared personal details about their lives and the way this brought their challenges and celebrations to life for everyone. And the feedback has been so positive. Most of the delegates stayed on afterwards to talk to the speakers, myself and Jenny. It has been so worthwhile bringing this important event to lots of civil servants across so many departments in Y&H. These are not life choices – no one would choose to face the challenges trans and intersex people face if it was a ‘choice’. If someone comes out to you as intersex or trans, ask them what they need from you and how they want to be treated – don’t presume or hide behind process. It isn’t just the person coming out that we need to remember to support – there are family, loved ones and colleagues who may also need support. While we have a lot of good guidelines, policies and practices in the Civil Service there is still a lot more we can do. This can vary from designing services and forms that include different gender options (not just male or female), to creating policies that support parents and partners of people transitioning. The list of actions we could take is long so I’ll not go on, but put simply we need to consciously think beyond the binary of male and female in everything we design, build and do. Our work is about raising as much awareness across the Civil Service as we can. We want to be visible on issues that trans and intersex colleagues may encounter, support managers, and assist policy and guidance writers to ensure the right information is circulated. Looking at feedback from the event I think we succeeded in raising awareness. You can read books and you can watch videos, but the power of having real people talking to you about their life experience cannot be underestimated. The rawness and emotion from the personal stories delivered at this event added ‘the human factor’ and for that I thank Emma and Hal who spoke about their experiences. I wanted to be included into society in the 70s and the fact that we are still talking about it today shows that we have not reached our vision, but we are working towards the Civil Service becoming the country’s most inclusive employer by 2020. It’s encouraging to see progress; for example some government buildings have gender neutral facilities and non-gendered staff passes for non-binary or gender fluid people. And let us not forget our allies and friends who have joined the network’s they add a valuable powerful voice. We have such a gender diverse workforce, so events like this help people to recognise that gender is a changing spectrum, and allows them to open up in a safe space and challenge assumptions and misconceptions. If you’d like more information about our a:gender network email us at agender@homeoffice.gsi.gov.uk. Hi, I’m Jenny Turner. I’m the Diversity & Inclusion programme lead at the Department of Health and Social Care. I’m always looking at what for practical action we can take to help us reach the Civil Service ambition, as set out in the D&I strategy, of becoming the most inclusive employer in the UK by 2020. Following our successful Pride event in the summer I was pleased to be able to work with Shelley again on this event. I firmly believe that departments should collaborate as much as possible on cross-cutting topics like diversity and inclusion to make real progress. I’d not heard the speakers before and was inspired by these individuals who shared moving stories of their experiences in a way that was informative but also humorous. I can’t thank them enough for being so open about challenging periods of their lives. For me, it was really important that we held this event during LGBT history month as historically we’ve not focused on Trans or intersex issues. However, this is only the start and we’ll continue to look at Trans and intersex issues going forward to give them the focus they deserve. We still have further to go on our journey to becoming the most inclusive employer but the fact we had colleagues from 8 departments across Yorkshire & Humber region join us was tremendously encouraging. The level of interest generated and the energised conversations that happened after the event show that gender diversity does matter and crucially that people care about this agenda. If you want to hear more about why this is such an important subject for civil servants why not check out our video. Very Interesting Blog and video. Sounds like it was a very inspirational day. Thanks Sam. It was. I’d recommend other events like this for anyone. We all have a role to play on positive action to promote and understand diversity and inclusion to help make us a Brilliant Civil Service. This blog was an interesting read. I attended a Trans and Intersex Awareness event in November last year in Sheffield and it was brilliant. I came away with much more knowledge and awareness which was testament to those involved their knowledge and also their honest personal stories which were a bit of a rollercoaster of emotions. I’d recommend this event to everyone. Hi Patrick, sounds like you and I were at the same event last year. It was what inspired me to do something on the same topics in Leeds. It is so vital to keep raising awareness and having important conversations like the ones sparked at events similar to these. Glad you liked the blog too. Shelley, thank you for sharing. As you say, this is only the start and we need to look in depth at Trans and intersex issues going forward in 2018, to give them the real focus they deserve and need. We do have some way to go, but as a dept we are committed to making a real meaningful difference to the journeys of our colleagues in order to be the most inclusive employer that we aspire to be.